All day class - $650. Mileage at current IRS rates. Watch thispage as more workshops are offered! It is my goal to offer workshops that require little or no financial investment for the students. String quilts have been popular for over one hundred years as a way to utilize every little piece of fabric. Those of you who need to "stash bust" (and who doesn't?) will love this class! Learn several ways to piece with strings. Those long, skinny leftover bits of fabric that are too small to do anything with are perfect for this class. Great news: Nothing to buy for this workshop! Just bring bits and pieces of any leftovers and see how valuable they can be under the right circumstances. Precutting will speed up the process but isn't necessary. RAVISHING RIBBONS: Karen Griska has kindly given her blessing for me to teach the method she used to make her quilt Fandango. So much fun to make and such dynamic results! Of course it isn't really ribbons, it's just leftover bits and pieces of fabric, sewn in a method that creates this stunning basketweave effect. No, this is not about cowboy quilts. It's about gathering up workshop leftovers, blocks that didn't fit, things with no place to go. Failed experiments, flea market impulses turned bad. What to do with all those things? Believe it or not, they make amazing quilt tops when put together! The hardest work is already done, you just need the encouragement to put them all together into unique, one of a kind gems! Let's do it! Sock it to me Hot Lips is an odd assortment of vintage blocks set together. Harvey Had a Hundred Pound Hog is another. Have you ever wondered what to do with those out-of-style doilies, dresser scarves, runners, hankies, tea towels, laces? We all have something that belonged to someone we love, but what to do with all that old stuff? Here's the answer. We will create a one of a kind art piece from your sweet old treasures. Learn to work with laces and crochet, cleaning tips, more. Fast and fun - and oh, so very beautiful! Okay, okay, so the White Peacock isn't all white, but you get the idea of working with white. He's made of a Battenburg tablecloth and three huge doilies. 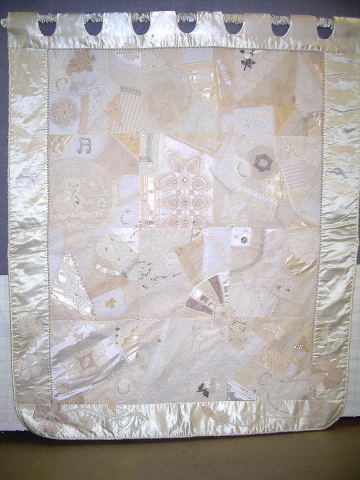 This absolutely adorable quilt from the 1930's deserves a comeback. It will look amazing duplicated as is, done in 1930's repros, batiks, or wild funky colors. I'm working on a workshop sample with all plaid baskets. You will learn several alternatives for applique, choice of straight set or on point like the original, two ways to make yo-yos and some simple embroidery stitches to complete the block. Kit Fee of $20 is required in class. Fee includes Cindy Claycamp's printed pattern, basket interfacing, embroidery threads, and enough vintage yo yos for one complete block.